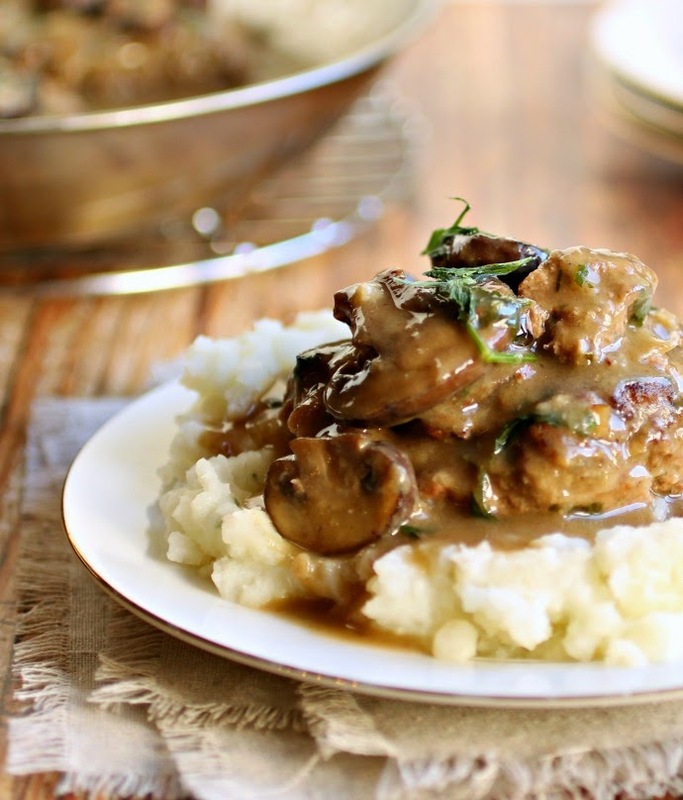 Can you even hear Salisbury steak mentioned without thinking of childhood? For me it represents the quintessential frozen dinner, that special treat that my mother rarely allowed. But when she did finally give in and I had a choice, it was usually this one that I'd pick. The irony, of course, is that as an adult with the ability to purchase that meal whenever I wish, I no longer want it. At least not in the frozen version. 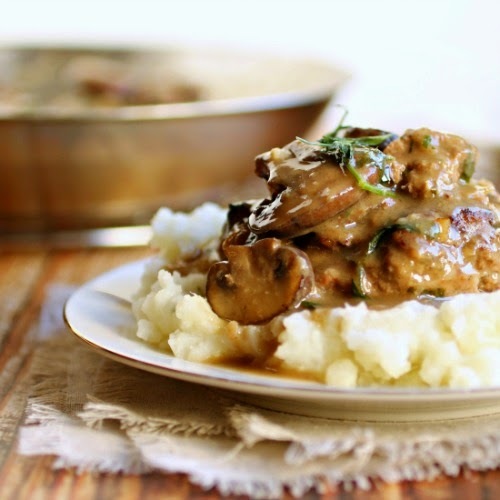 The scratch made Salisbury steak is not only easy to make but the aroma of sizzling beef and mushroom gravy coming together is as wonderful as the dinner itself. Enjoy! In a bowl, combine the beef, egg, onion, breadcrumbs, parsley, salt, pepper and garlic powder. Mix by hand, gently and form into 4 equal patties. Heat the butter in a large skillet and cook the beef patties, on medium heat for 5 minutes on each side. Remove from the pan and set aside. Add an additional tablespoon of butter to the pan along with the mushrooms and cook on medium heat for about 5-7 minutes or until slightly browned. Move the mushrooms to the sides of the pan and add the flour to the center. Slowly whisk in the beef stock, making sure to scrape up all the browned bits on the bottom of the pan. Season with salt and pepper and return the beef patties to the pan. Continue to cook on medium low heat for an additional 10 minutes for the sauce to thicken and the beef patties to cook through. Finish by stirring in the final tablespoon of butter and the parsley. Serve over noodles or mashed potatoes. Makes 4 servings. The sauce, the mashed potatoes, the mushrooms...you've made me so hungry with this! It looks perfect. I definitely thought of the frozen dinners of my youth when I read the title of your post. Honestly, I have never thought of making Salisbury steak myself before I saw your picture. Looks absolutely delicious. A must try! Funny story - salisbury steak is the one frozen tv dinner I absolutely hated. HOWEVER, I know I enjoy salisbury steak from scratch, so I can't wait to try your version. We didn't really do tv dinners when I was a kid, but Salisbury steak is still one of my comfort foods. Yours looks perfect, Anita! 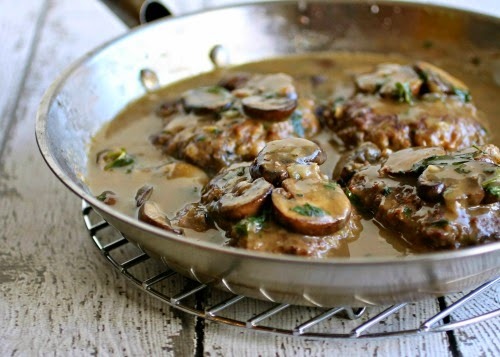 Salisbury steak is one of those comfort food meals that I just can't get enough of. Yum! I never had salisbury steak until I was an adult and I believe it was one of those frozen dinners (because I worked for a food broker was given samples to try). Anyway, I really didn't care for it until I actually had a real homemade one. So much better! I just made this. It is delicious. Really good. As usual, I will make some minor modifications next time, as per personal preferences. Thank you. I had a deprived childhood of only frozen dinner versions of Salisbury steak. This steak had the same taste you want, only better and fresher and made from scratchiness.